Welcome to Verified's forum for internal and external news items about what Verified is doing for its clients and about the business in which we thrive. Enjoy. Verified Audit would like to welcome The Boston Phoenix and The Phoenix / Media Communications Group as one of its newest members. 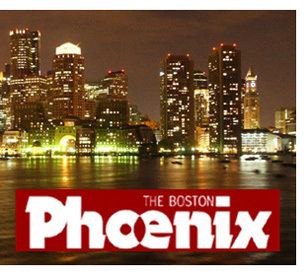 The Phoenix covers the arts and entertainment scene in and around the Boston metropolitan area. It began in 1966 as a four-page arts-and-entertainment alternative newsweekly and has evolved into one of the largest weekly publications of its kind in the country. Expansions into Providence, Rhode Island, and Portland, Maine, have increased geographic reach and total circulation. The Phoenix has received many publishing honors in its 40-year history, including a Pulitzer Prize in 1994 for critical music writing. Verified looks forward to meeting the audit needs of this award-winning publication. The Phoenix will complete their six-month initial audit in September. For more information on The Phoenix, visit www.bostonphoenix.com. For more information on how you can work with Verified Audit, please visit www.verifiedaudit.com. 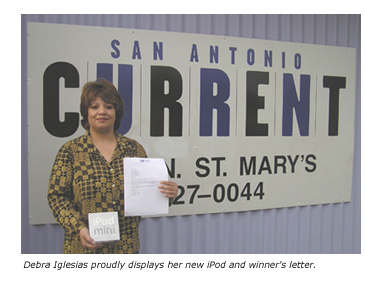 Debra Ann Iglesias, the Circulation Director for the San Antonio Current, is the happy winner of our Apple iPod Mini giveaway for signing up to use the Verified Web Wizard. Debra has been with Verified Audit since 2000, and although she felt the old program was easy to work with, she said, "Between making copies and mailing, I always worried that they might not make it to you." She also admitted that she was slow to make the upgrade to the Web Wizard. "I dragged my feet on trying it," said Debra. "Once I started to input information, I found that it was so much easier. Now I'm glad to say I input my weekly information while listening to my new iPod." We're happy to have made the transition more fun for Debra, and we hope to see more of you switching to the Web Wizard for the sake of greater convenience to you if not for a new iPod. With a username and password, users can access the Wizard program and view an electronic version of the QPD and Zip Code Analysis. Boxes indicate where data needs to be entered, and the program calculates totals. This is important because a significant number of current hard-copy submissions contain math errors. The online program is designed to spot most major errors before the data is submitted. Access to the Wizard program is freely available to all Verified clients. Clients actually save money because there is not postage, rush delivery fees, or faxes. All of Verified's clients will soon be required to submit their QPD and Zip Code Analysis online. For questions about using the Web Wizard program, call Verified and talk to an account coordinator who will help you get started. Electronic data filing brings added convenience, cost savings, and flexibility. Route List Cover Sheets Now Available Online! You can instantly get a Route List Cover Sheet whenever and wherever you go. Go to www.verifiedaudit.com and print it right from our Website. It's easy and convenient. Auditor Ray Schiel has more than 30 years of experience in circulation, including time spent with the Chicago Sun-Times and the St. Petersburg Times. Be part of a hotel program. Ray says, "As a field auditor, I stay in almost 300 hotels a year. The first thing I look for when arriving in a new town is a source that can tell me what is going on in that area." A hotel program is a great way to increase your circulation outlets. You can also work with hotel management to have your publication delivered to every room by offering them an advertising trade out. The National Association of Hispanic Publications Foundation (NAHP Foundation) recently sponsored a study on circulation audit use by Hispanic publications and media buyers. More than 120 Hispanic newspapers and magazines with a combined circulation of nearly 10 million are audited today. The study revealed that consistently audited publications earn almost twice as much as those that are occasionally audited. Regularly audited publications also proved to sell considerably more national advertising and free-standing inserts, with average annual ad revenue for consistently audited publications increasing dramatically ($2.5 million) over the occasionally audited ($1.3 million) and unaudited ($560 thousand). Publicatons audited from their first year of publication sell 33% more ads than those that wait a few years to be audited (among publications started within the past five years). Despite the advantages of becoming audited, 45% of publications noted cost as the main factor not to be audited and 30% pointed to the amount of paperwork involved. The study was conducted by Western Publication Research.